Adrien Broner (27-1, 22 KO’s) pushed hard on Golden Boy Promotions for a rematch against Marcos Maidana (35-3, 31 KO’s) and he’s been given his wish, according to Dan Rafael of ESPN. Broner will be fighting Maidana in a fight that could possibly take place in April. With Maidana now unofficially off the table as one of the possible options for Floyd Mayweather Jr’s May 3rd fight, it leaves Amir Khan front and center as Mayweather’s likely opponent for this date. It was pretty much a given that Khan would be the guy for Mayweather’s next date, considering how much praise Showtime’s President of Sports Stephen Espinoza had for Khan as Mayweather’s ideal opponent in an interview earlier today by Rafael. Broner believes that he can turn things around in a rematch and beat Maidana to win back his WBA welterweight strap. It’s possible that Broner had gathered some confidence by looking at how Maidana gassed out in the last four rounds of their fight on December 14th. Maidana looked tired, and Broner was nailing him with some nice shots. At the end of the 11th round, Broner tagged Maidana after the bell with a hard punch that hurt him. It’s true that it came after the bell, but the punch still had Maidana hurt. 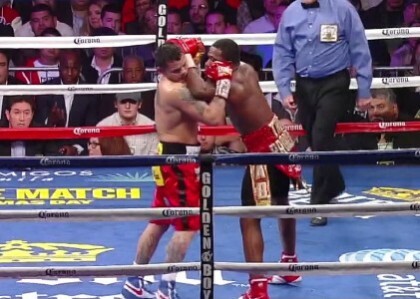 In the 12th, Broner hurt Maidana again with a big right hand to the head. Maidana was able to come back from the shot and hit Broner with some hard punches of his own. But it was clear that Broner was the stronger fighter at the end of the fight, and not just in the 12th round. Broner was the better fighter in the last 4 rounds, period. Broner has a lot to improve in his game for him to have a good chance of beating Maidana in the rematch. The fight wasn’t close enough to give you the sense that Broner can beat Maidana in a rematch. The Argentinian fighter is too strong and too sturdy for a small guy with Broner to beat. There are guys that can beat Maidana at 147, but Broner doesn’t seem to have he weapons to get the job done, at least he didn’t show it on a consistent enough basis last December to make you think he can.